Francine's Friends: Purchase a Community Days booklet and show your support for FRANCINE’S FRIENDS! 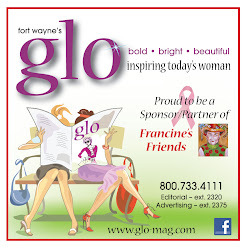 Purchase a Community Days booklet and show your support for FRANCINE’S FRIENDS! Carsons believes in supporting our community and they are offering a terrific opportunity for local nonprofits. 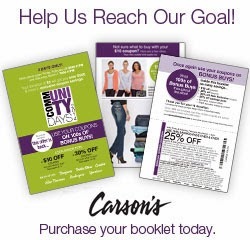 Coupon booklets, loaded with fantastic offers, will be available to use at the Bon-Ton family of stores during the Community Days event shopping days on February 28 & March 1. Each booklet includes a $10 off coupon that can be used on an item priced at $10 or more, a value worth double the $5 price of the booklet! And there is a 25% shopping pass! Plus coupons can be used on top of Bonus Buys! For every booklet we sell, Francine's Friends keeps the entire $5 purchase price. 100% of the proceeds from the booklet sales will help us. The coupons in the booklet can be used at any Bon-Ton, Bergner’s, Boston Store, Carson’s, Elder-Beerman, Herberger’s, or Younkers store. Or online for purchases of regular, sale price and clearance items, including 10% off electronics, fashion watches, furniture & mattresses. Come see us in person and purchase books this weekend at Carsons in Fort Wayne. Francine's Friends will be in the house on Friday, 2/21 from 10:00-12:00 and 4:00-8:00, Saturday 2/22 from 10:00-12:00 and 4:00-6:00, and Sunday 2/23 from 2:00-4:00. I want to Buy daniel wellington 0501dw watch online from USA any one can help me?